Israel's treatment of four hunger-striking Palestinians is an "ethical failure" an Israeli NGO said on Sunday, adding that their rights were being violated. A statement from Tel Aviv-based Physicians for Human Rights said that the fasting prisoners were denied visits from independent doctors and manacled during hospital checkups. "Physicians views with extreme gravity the fact that the rights of the hunger strikers are being violated time and again by various authorities, whose representatives act against the law, regulations, international conventions and medical ethics," it said. "This is a systemic moral, ethical and professional failure," it added. 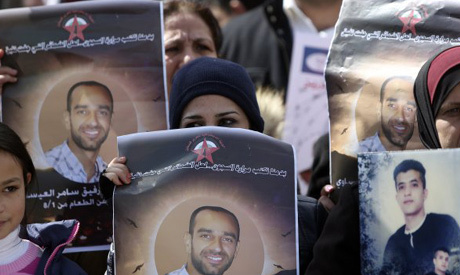 It was the latest in a chorus of protests from around the world about the condition of hunger-strikers Tareq Qaadan, Jafar Ezzedine, Ayman Sharawna and especially Samer Issawi, who has been fasting the longest. On Saturday the European Union called for Israel's "full respect of international human rights obligations towards all Palestinian detainees and prisoners." A day earlier International Quartet envoy Tony Blair said in a statement that he was "concerned about the deteriorating health condition of the four prisoners, one of whom has been on a hunger strike for over 200 days." Dozens of Palestinians were injured in clashes with Israeli security forces on Friday as they staged protests round the West Bank in solidarity events for prisoners. On Wednesday the United Nations expressed its concern for the hunger-strikers and called on Israel to end its practice of "administrative detention" under which suspects can be imprisoned without trial by order of a military court. The order can be renewed indefinitely for six months at a time. All four are administrative detainees and Palestinian prisoner support group Adameer says that the current terms of Qaadan and Ezzedine were due to end on February 22. It says that Sharawna is one of several prisoners released in a 2011 prisoner exchange who were rearrested by Israel shortly after. Altogether 1,027 prisoners were freed in a trade for the release of an Israeli soldier held captive by Gaza militants for five years. Gaza's militant Hamas rulers said on Sunday that by putting freed prisoners back behind bars Israel was reneging on the deal. "Hamas condemns the Israeli decision concerning the agreement on the exchange of prisoners," the group's spokesman Sami Abu Zuhri said in a statement.